Although arguably it wasn't until after the second world war that drama productions became a staple diet for British television viewers, and not until the late 1950s before the likes of Laurence Olivier and John Gielgud finally accepted the medium as a serious rostrum to present their considerable talents, the theatre provided a source of programming even in television's experimental days. The first ever television play was presented by the General Electric Company's test station WGY, Schenectady, N.Y., USA. Written by J. Hartley Manners and adapted by Mortimer Stewart, 'The Queen's Messenger', a 40-minute transmission on a low-definition 24-line mechanical system developed by Doctor Ernst Alexanderson, was broadcast for the benefit of the television developers in the days before TV sets were commercially available. The date was 11 September 1928. Within a few short months British TV experimenter John Logie Baird presented an experimental transmission of a play from the Baird Company's studios at 133 Long Acre, London. 'Box and Cox' was probably seen by about several dozen viewers in addition to Baird's staff, as a number of amateur constructors were known to have built their own receivers from instructions published in the quarterly magazine 'Television'. However, these would only be able to receive moving images whilst the soundtrack would be picked up via an ordinary radio set. It wasn't until 1930 that the BBC transmitted its first television play. Pirandello's 'The Man With a Flower in his Mouth' was broadcast from the same Baird studio on 14th July, although once again this would only have reached a limited audience on their 30-line receivers. This production is notable for being the first recorded instance of make-up being used to accentuate the actors’ features. 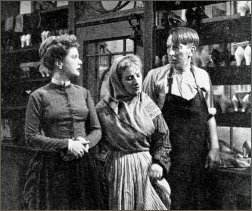 It was another six years before the BBC aired what has generally become acknowledged as the first television version of a play shown to the public in a regular TV service. 'Marigold', described as a "Scottish comedy" by L. Allen Harker and F.R. Pryor was transmitted on 6 November 1936, the fifth day of the BBC's scheduled service when the numbers of viewers were estimated at 300. However, the play was not shown in its entirety but in what was to become common practice in these early years, selected scenes. 'Marrigold' starred Sophie Stewart who was at that time appearing in the West End production of the play and was shown from 3.35 to 4 p.m. Two years later on 16 November 1938, the BBC broadcast the first television play performed for the cameras inside a genuine theatre. St Martin's Theatre in London was at that time host to J. 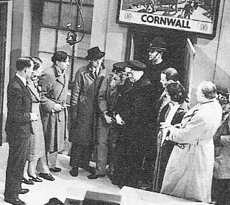 B. Priestley's 'When We Are Married', and it was from this broadcast that producers became aware of the value of having a 'live' audience. The following year saw the first musical production to be broadcast from a stage when the BBC aired 'Magyar Melody' from Her Majesty's Theatre. The date was 27 March, 1939. Years before that Baird had experimented with both music and dance with the first ballet performance going before the experimental cameras - probably in 1928 or 1929. Unfortunately, there are no records to substantiate the exact date although the ballerina Ailsa Bridgewater wrote to 'Television' magazine in 1935 that the transmission started at midnight. This would set the transmission between 5th December, 1928, and 30th September, 1929, when Baird was only permitted to transmit at this time. Ms Bridgewater went on to write that: "Owing to the fact that a full-length picture was then impossible, after a short introductory speech I mounted the stage which was more in the form of a table than anything else, and commenced to show the rudiments of ballet technique within the carefully marked out space." It is obvious from the rest of her letter that Ms Bridgewater was perfectly aware of the historical significance of her performance as she goes on to state that: "From the moment when the red light showed suddenly and brightly, and the immediate "all quiet please" came from the announcer, an indescribable feeling of romance inevitably pervaded the next half hour. Despite a certain amount of natural nervousness at facing both the microphone and the televisor, to a far greater extent was the thrill and realisation that this was the foundation of a new means of presenting the art of dancing to the public." Rarely has such a significant moment in the history of television development been so succinctly reported. Alice Through the Looking Glass - made in 1937. From 1936 to 1938 the BBC transmitted a series called 'Theatre Parade', which presented selected scenes from popular London theatre productions of the time, although these were filmed in the BBC's television studios at Alexandra Palace. In 1937 the first production of Lewis Carroll's 'Alice Through the Looking Glass' went before the cameras courtesy of Nancy Price's Little Theatre production and starring Ursula Hanray as Alice. 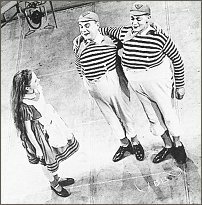 (Pictured above with Andrew Lee on the right as Tweedledum, and Ernest Butcher on the left as Tweedledee). Shakespeare's 'Twelfth Night' transmitted on 14 May 1937, is the first recorded instance of the Bard's work being shown on television. The production starred Greer Garson in only her second television appearance, although she went on to become quite a star of early television during this period. Producer was the prolific George More O'Ferrall. 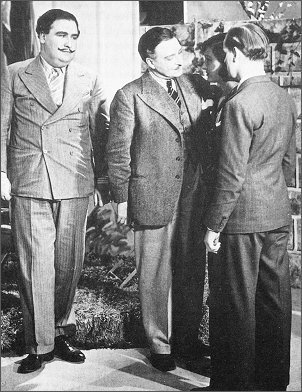 On 28 June 1937, the first Agatha Christie character to make a television appearance was Hercule Poirot in the form of Francis L. Sullivan (see top picture), who had been closely associated with the character on the London stage since 1931. The 25-minute production of 'The Wasps Nest' was a hitherto unpublished and unperformed play. Greer Garson, Derek Evans, G.B. Shaw, G.M. O'Ferrall and D.A. Clark-Smith. 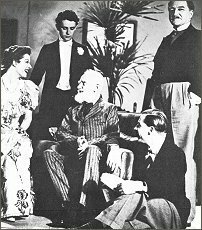 George Bernard Shaw allowed his play 'How He Lied to Her Husband' to be televised on 7 July 1937. It was also the only play that Shaw had (to that time) allowed to be shown in the cinema. Greer Garson starred and O'Ferrall produced yet again. During rehearsals the author himself visited the set. 'The Ghost Train', a play by Arnold Ridley (who in later life found fame as Godfrey in the classic British sitcom 'Dad's Army') went before the cameras in an ambitious 40-minute production on 20 December 1937, featuring the full West End cast of eleven characters. Throughout 1938 and 1939 a number of playwrights’ works made their television debuts by way of adaptation or specially commissioned material. Amongst those authors were such notables as W. Somerset Maughan, Edgar Wallace and Noel Coward. However television production was curtailed by the start of the Second World War and it wouldn't be until 3.00pm on 7th June 1946 that the BBC resumed normal service. From such modestly tentative beginnings, the fledgling area of television drama would go on to become one of the most powerful genres of the new form of entertainment. The relationship between TV and the theatre has always been an uneasy one and in the decades that followed it was television and not theatre that was able to exploit, explore and refine this mutual relationship to its advantage. Television, without doubt, fared better as entire new sub genres of drama grew from the initial fusing of the two disciplines. Theatres simply saw their box office takings fall dramatically. By the start of the 1950's there was a genuine fear about television from the so-called 'serious' theatregoers. Perhaps it was one that was not entirely misplaced. However the wheels of progress were turning and a definite change was in the air. Television had returned to British screens when one of the original 1930's announcers, Jasmine Bligh, greeted viewers from the steps of Alexandra Palace with; "Hello, everybody, remember me?" Later that afternoon the BBC transmitted 'The Dark Lady Sonnets' a play by Bernard Shaw, produced by George More O'Ferrall. Plays by Shakespeare, Oscar Wilde and Edgar Wallace were still popular but now there were more plays especially written or arranged for television. As the decade drew to a close so the BBC continued to expand its audience. By 1948 the number of television licences had risen to around 66,000 due, in no small part, to television coverage of the XlV Olympiad from Wembley Stadium. In 1949 the first provincial transmitter opened in Sutton Coldfield bringing TV to the midlands for the first time. That same year the BBC acquired the Lime-Grove studios from Gaumont-British and they were also given planning permission to build a Television Centre at White City. More than ever television needed new and fresh material. 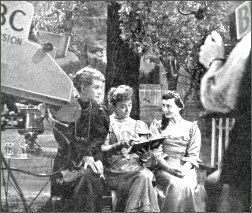 'The Seagull' - authoress Luise Rainer visits the set and chats to Tatiana Lieven and Jeanne de Casalis. To this end, Val Gielgud, brother of actor Sir John Gielgud, was put in charge of the television Drama Department (note it was not called the BBC Drama Department because in those days the BBC was television). Gielgud played a key executive and creative role in radio drama production at the BBC from 1929 and was responsible for directing 'The Man With a Flower in his Mouth' in 1930. His new task, to lay the reliable foundations for a regular supply of new material to television, did not begin to blossom until 1951, when he brought to the screen the works of Terence Rattigan, James Birdie and J. B. Priestley. But 1950 got off to a poor start. Very soon there was considerable viewer and press criticism of the morbidity of the plays selected by Alexandra Palace. The sombreness of such pieces as 'Craven House' and 'The Seagull', each shown in one continuous piece, did nothing to convince viewers that serious full-length drama had a place on television. Even T. S. Eliot's 'Family Reunion' did nothing to lift the gloom. Wilfred Pickles made his TV acting debut in 'Hobson's Choice.' Pictured here with Belle Chrystall and Sibell Gill. Following criticism of this phase, Gielgud hurriedly commissioned Gordon Harker to write 'The Poltergeist' - and Wilfred Pickles made his television acting debut in 'Hobson's Choice'. In 1951 Gielgud was replaced as Head of Drama by Michael Barry. The summer of 1951 saw a fairly balanced mixture of family-story, thriller and comedy plays although the lamentable absence of new material continued. At this point the BBC were producing two plays a week, but for some critics this was stretching the BBC's resources to straining point. Writing in the 1952 'Television Annual', Kenneth Baily observed: "Insufficient trouble is being taken by the BBC to find good-for-TV plays. The stage play in its conventional three acts is too long for convenient and comfortable home viewing. Recognition of this very practical factor should by now have caused the BBC to make strenuous efforts to have plays of no more than 60 minutes duration specially written for the small screen. Television drama producers are so hard pushed to fill never-ending drama spaces in the schedules that they must necessarily resort to plays off the stage bookshelf." Baily went on to criticise the BBC for its "lack of imagination, its banality and its shoddy production." Baily's assessment of the BBC's drama output may have been unfair. For while the BBC struggled with a meagre budget to provide all its programming, a hefty part of it was allocated to drama production. 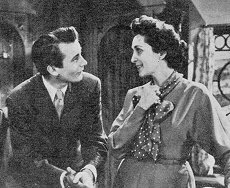 Between 1949 and 1952 drama was the popular peak of BBC television even though it was only occupying around 15 per cent of transmission time. By 1954 that had been reduced to 12 per cent. The face of drama on television was to change drastically with the arrival of ITV. Laurence Marcus, May 25th 2008 | Sources of reference: The Guinness Book of TV Facts and Feats by Kenneth Passingham | Television by Burton Graham | British Television by Tise Vahimagi | The Television Annual - 1952. Denholm Elliott & Mazine Audley in an early 50s BBC play. 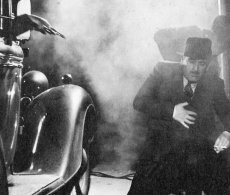 'On The Spot' shown in 1938 was a play by crime writer Edgar Wallace. 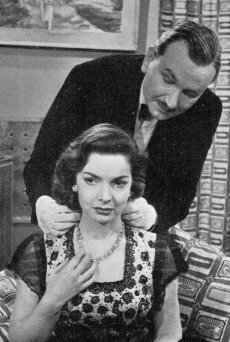 Raymond Huntley and Elizabeth Sellars in 'Take Away the Lady' shown on 26/04/1953.